– Four thematic screening programs, which explore our political attitude and resistance (Get [it] out of your system), the world of fashion and our dependence on it (Flow along surface), the naked body as a medium of dialogue and expression (Shell) and a screening program for a dystopian present future (The way it looks back at you). – Two programs dedicated to Greek Video Art (Anatomy of silence, The world is a theater) which highlight new morphological and conceptual trends that inspire Greek video artists nowadays, focusing especially on the young generation. – Three thematic units dedicated to Performative Arts, narrative video, video-performance and videodance (Act… with or without expression, Fragments of a story, vDance). These programs investigate the video art “loans” from the performing arts and deal with the morphological transformations of narration, space, object and body movement in these categories of video creation. – Two screening programs that deal with the concept of Space, investigating boundaries between private and public, familiar and unfamiliar, monumental and the anti-monument (In between, A chance to Cut is a Chance to Cure). – Two light and colorful programs (Daydream, Freeze Frame), which create their own poetic narrations through music, animation and digital experimentations. Video Art Miden is an independent organization for the exploration and promotion of video art. Founded by an independent group of Greek artists in 2005, it has been one of the earliest specialized video-art festivals in Greece and builded an international festival identity, presenting an annual video art festival for a decade. Since 2015, Miden continues its work changing its form to a more flexible and broadened event programming, setting as basic aims to stimulate the creation of original video art, to help spread it and develop relevant research. Through collaborations and exchanges with major international festivals and organizations, it has been recognized as one of the most successful and interesting video art platforms internationally and as an important cultural exchange point for Greek and international video art. It also provides an alternative meeting point for emerging and established artists and a communication hub between artists, organizations, festivals and art spaces around the world. 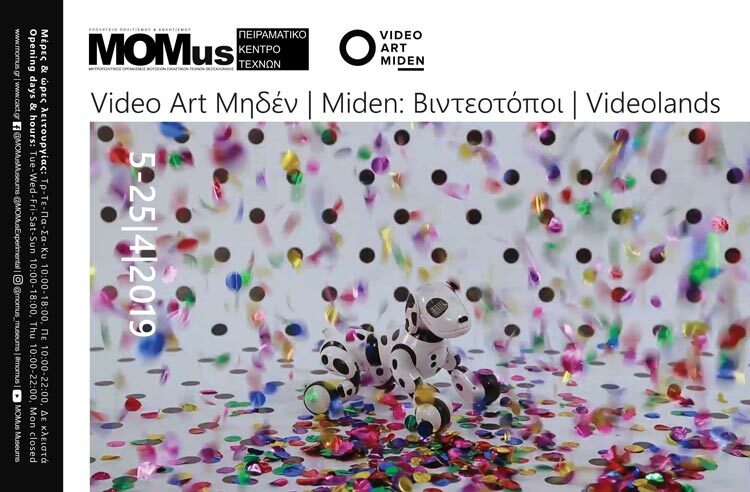 Miden screening programs have traveled in many cities of Greece and all over the world, and they are hosted by significant festivals, museums and institutions globally. The State Museum of Contemporary Art, the Macedonian Museum of Contemporary Art, the Thessaloniki Museum of Photography, the Contemporary Art Center of Thessaloniki and the Museum Alex Mylona are joining their forces, comprising the biggest organisation for visual arts in Greece, called MOMus – Metropolitan Organisation of Museums of Visual Arts of Thessaloniki. MOMus aims to present a new artistic programme of exhibitions and projects based on modern and contemporary art, photography, experimental arts and sculpture. In this frame, the former Contemporary Art Center of Thessaloniki is now called MOMus- Experimental Center for the Arts.